Kodari-jorim (코다리조림) is a savory braised dish made with semi-dried pollock fish and radish. They are simmered in a sweet and salty seasoning sauce until it’s reduced and fully absorbed, making them savory and flavorful, and the radish soft and juicy. It’s served as a side dish to rice. It’s a simple and cheap side dish popular among Koreans. Semi-dried pollock fish is called kodari in Korean. It’s half-dried in the sun and wind and sold in a Korean grocery store in the frozen section, usually in a package of two, but sometimes as pre-cut pieces, at a weight of 1½ pounds, making them perfect for this recipe. The key to this recipe is to slice the radish thinly. It should be about ¼ inch thick so it cooks fast and easily imparts the fish with its sweet flavor. If you are a seafood lover, this is the perfect delicious dish for you to make at a reasonable price! Combine the sauce ingredients in a bowl and mix well. Set aside. Remove the fins and gills from the fish, and gently scrape the tiny scales with a blade of kitchen knife and remove. Remove the black film from inside the fish. Cut off the tip of the mouth with the teeth and discard. Cut the fish crosswise into 2½ inch long pieces. Wash the fish in cold running water and drain well. Place a heavy shallow pan on the stove. Spread the radish and onion on the bottom of the pan. Add the pollock over top of the radish and onion. Put the seasoning sauce over the pollock. Add 1 cup water. Cover and cook for 20 minutes over medium heat. Uncover and scoop some broth from the bottom of the pan over top of the fish several times. Add green onion and red (or green) chili pepper. Reduce the heat to low and cover. Cook for 10 minutes. Open and turn up the heat to high. Cook for a couple of minutes, scooping some broth with a spoon and pouring it over the fish and radish until the broth is almost all evaporated. Garnish with the sliced green onion and serve right away with rice. Posted on Tuesday, January 2nd, 2018 at 7:59 pm. Last updated on January 5, 2018. Posted June 28th, 2018 at 4:27 am | Log in to reply. I watched this Kodar Jim video just yesterday and I just want to go thru the tv to grab some and eat! My mouth was totally watering because of this fish dish! So today, after my daughter’s class, we went to a Korean Grocery store even though its far and I was in search of all of the ingredients. 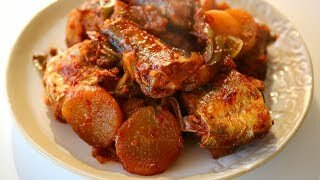 Unfortunately there was no available kodari in that mart so I decided to used some SAURY and followed your recipe and viola!! It turned out so good! I kept on eating it haha! And you’re right the radish was divine and the fish was very tasty! I didn’t have to worry about the bones that much because they are not that hard! Thank you for this delicious dish Maangchi! You Rock! Posted June 28th, 2018 at 7:51 am | Log in to reply. I’m so happy the saury worked very well. Happy cooking! Posted January 7th, 2018 at 5:10 am | Log in to reply. I’ve been a fan for a few years now, but am only now getting around to registering and posting my first comment. Just want to let you know how much I appreciate your easy to follow directions and videos, as well as your explanations of why things are done the way they are (something Korean moms don’t seem to explain, lol). My husband has loved every dish I have made following your directions, and we joke that I can’t get by in the kitchen without your guidance. Thank you, Master Maangchi! Posted January 15th, 2018 at 9:51 pm | Log in to reply. Thank you so much for your nice words and good tips about canned sardines. Actually any canned fish will work well, like Korean canned mackerel. I’m so happy to hear that your whole family loves your Korean cooking! Posted January 15th, 2018 at 10:27 pm | Log in to reply. Oh, that is nice to know that I can use any canned fish – thank you! I haven’t cooked much fish for my family because I’ve always been a bit scared about handling fish (so I’ve stuck to cooking filleted fish only), but your video for this kodari recipe made handling a whole fish seem possible for me. I will give it a try when I am able to buy kodari next time, as I’m sure it’ll be much more delicious than using canned fish. Thanks again for giving me the courage to attempt fish recipes for my fish-loving husband (and son, who takes just after his dad). I can’t tell you how happily they gobbled up this fish dish. We all thank you sincerely with happy, full bellies! 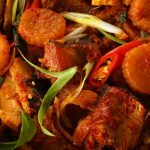 This recipe was originally posted on January 2, 2018 at 7:59 pm by Maangchi. It was last updated on January 5, 2018. The video was watched 276,389 times on YouTube & has 6,799 likes!